Patrick is an associate with the Firm’s Real Estate Group whose practice focuses on commercial real estate law with a concentration on property acquisitions and dispositions, secured financing, REIT transactions, leasing and joint ventures. He has represented parties in both the acquisition and sale of commercial real estate including hotels, shopping centers and office buildings. He has also represented borrowers and lenders in a variety of secured transactions including securitized financings. Patrick is also involved with the pro bono community in Chicago and is a Chicago Volunteer Legal Services board member. While in law school, he externed at the US Securities and Exchange Commission in the Division of Corporation Finance. 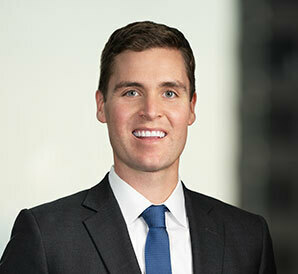 Prior to joining Barack Ferrazzano, Patrick was a real estate associate at Latham & Watkins LLP, where he assisted clients in a variety of complex commercial real estate transactions.